Disappointing because it was a LOT of work and tasted, well, not extraordinary. Blah. I was inspired by this beautiful post about an apples-and-honey challah – sounds amazing, right? Stuffed with apples, it truly is gorgeous – click over and check it out (the one above, left, is mine). But she doesn’t show you a picture of the inside, so I’ll cut right to the chase and show you that what looks like a TON of apples, going in, totalled to a few straggly bits that didn’t make a noticeable difference to the bread itself. To be totally, TOTALLY fair, I didn’t follow her recipe. I used Maggie Glezer’s Czernowitzer Challah, because I’ve used it for stuffed onion/poppy challahs every Purim and it always works out okay. I think it’s not as sweet a dough, but the texture was also eminently ordinary. Chop up apples – the original uses bigger pieces, and perhaps they’d be less juicy if you didn’t cut them so much… and they might not “vanish” into the bread in the same way. Roll out the snakes, but flatten them to add the apple. Ignore the odd “bone” shape of the dough here. I felt the ends were getting too skinny, so I folded them back and it worked out okay. By the time I had done four of these, you can’t tell from the pictures, but I had a sopping mess on the table and was practically screaming with frustration. I absolutely could NOT keep any of the snakes closed for more than a few seconds. The dough was too wet and sloppy and… well, argh. I have no idea how it looks so good in the pictures. And behold – an actual, slippery, newborn challah. You can’t tell from this picture, but 20+ challahs later, I’ve become very, VERY good at this woven challah that was new to me only a couple of weeks ago. In any event (or, as they say in England, “in the event,” which means a totally different thing over there - “he was sent on this important and, in the event, quite fruitless mission,” or, in this case, “she braided this awkward and, in the event, quite fruitless challah”)… so anyway. The challah dried out nicely while it was rising and despite my fears that the breads would slip open and slop their contents all over the pan while it baked, turning it effectively into sticky buns, the snakes actually stayed shut and miraculously, the bottom of the challah was solid and dry by the time it came out of the oven, revealing no hint of the tiny-bits-o-appley-goodness that lay within. Very, VERY tiny bits. Use a fairly firm dough – none of that no-knead stuff here. A sweeter dough, like the one originally called for, is probably best as well. Use larger chunks of apple than I did, so they don’t leach water all over your dough. But not too large, or they’ll poke out. Be generous with the apple so you can see it in the end result… but not too generous, or it’ll goober out everywhere. Work quickly once you’re filling and sealing the snakes. If you’re not confident in your ability to do a complicated braid with floppy, wet snakes, just simplify – create one long, fat snake and just do a coil challah instead. Have a bench scraper and side towel very, very handy, and don’t hesitate to use them… everything may ooze and stick and you’ll need to dry/scrape it up quickly. Bake time will be longer than usual because everything is so very, very wet. I found my thermometer almost essential – you can’t tell if it’s done from the outside. … can make a HUGE difference. We all say it, but I think this is the best example of one teeny change that can make a huge difference to my baking life. Anyway, they’re perfect… except they keep getting lost. And I have nowhere good to store them in the chaos that is my kitchen. Regular oven mitts are usually returned dutifully to the hooks next to the stove, but having nothing “hook-able,” the gloves just get tossed (by me – I admit it!) wherever when baking is done, only to be missing when they’re needed next (often just a couple of minutes later – I am that absent-minded). And then it came to me! I now crochet! Just crochet a little loop onto each one and – hey, presto! – an easy shortcut to happy glove storage-land. So I did and less than fifteen minutes later, there they are up at the top of this post and, well, here’s where we all live happily ever after. Has a “little thing” made your baking life so much happier??? What was it? Made the dough last night – basic no-knead recipe, with 1/3 spelt, mostly because I was out of white flour, but also to feel just a teeny bit virtuous despite our second “starch” supper in a row (last night was homemade pasta with home-grown tomato sauce; so sue me). Crock-pot caramelized onions! Actually, I hadn’t meant to leave the crock-pot on the whole time we were out, because I started them at 1 a.m., and as far as I was concerned, they were ready by breakfast time. But I don’t think they suffered much for the overcooking, except for looking even more disgusting than they had before. Anyway, they look GREAT spread out on a crust… (This dough was so soft I didn’t bother with a rolling pin. Just grabbed 1-lb for the cookie sheet and approx 2/3 of a lb (or 3/4?) for the small one, rounded them out and let them sit for a while. By the time I came back (I spent half an hour making honey cakes! ), they were very, very soft and eager to spread out just with my oiled fingertips. Can’t take “after” pics because I’m heading out, but trust me – these are going to be delicious! And a super-super easy alternative to the “one-pot” cooks-all-day meal. You know, in case your family is sick of stews and meal-in-a-dish type things. Well, I have no idea why, but I am putting together a challah bake sale for next Sunday, erev Rosh Hashanah. With free pickup here or personal hand-delivery in the neighbourhood. Funny thing – I was looking for a picture of a baked, streuselled round challah I could post on the sale page to tantalize potential clients, but couldn’t find a single thing worth sharing after probably more than 10 years of non-stop yom tov challah baking. Looking again, I did find the one I just stuck in at the top of the post here… which looks okay at first, until you realize that half the challah has been eaten. Then again, though, perhaps that says a lot about the challah in question. It’s too yummy to photograph – it doesn’t last long. If you live anywhere nearby, grab it now, while you can!!! I was so excited when I saw that Shoshana of Couldn’t be Parve (one of my favourite kosher food blogs!) 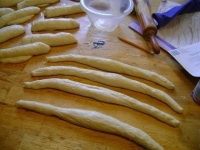 had posted this Round Woven Challah Tutorial. She used beautiful coloured dough – there’s even a video. So when I saw Shoshana’s tutorial, I thought - “why the heck not? !” I mean, I won’t wreck her tute for you, but I will share a sneak preview (properly linked, with credit, borrowed for review purposes only) and tell you she makes it look TOTALLY simple. So why the heck not, right? Well, because I’m a klutz, that’s why. And because I had already made my dough, which is one of my super-sloppy, no-knead, ultra-wet doughts that produces challah that feels like cake, but which lacks the substance needed for those truly chashuvah (chashuvah = important / substantial) braids or designs. Here are the snakes. This is after TWO stretch-and-fold operations, and believe me, it’s still totally sloppy and trying to melt into the tabletop. Call it Extreme Baking. The snakes are still a little fat in the middle, but much more elongated than usual. So I got overconfident with the second one, and tucked the ends under too much, leaving this weird blobbish look on top. Ugh. So I figured it out, kind of… when tucking the ends, you tuck them on TOP of the over-under bits, not THROUGH into the centre, or else they’ll be visible. Before tucking: isn’t this a beautiful shape in its own right? Okay, still pretty klutzy… but hopefully, delicious! 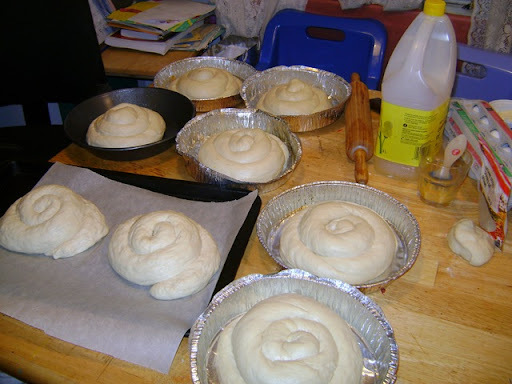 How do you do round challahs? Lazy way? Fancy way? Something in between?? ?